The MHRA Human Factors Guidance 2017 document has been published. 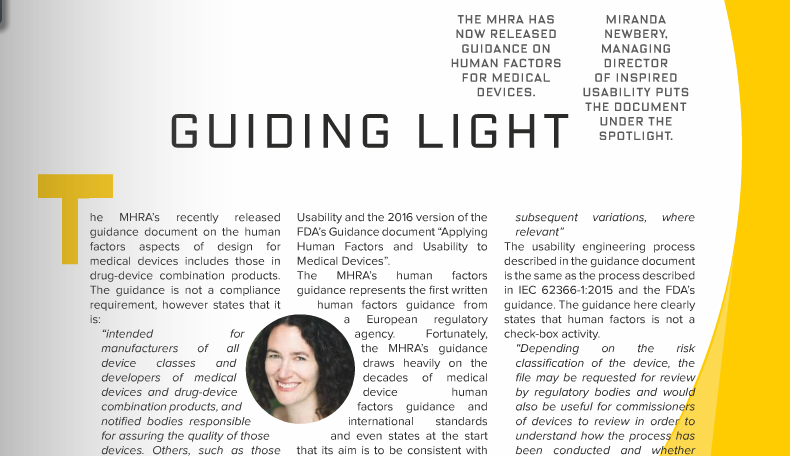 Inspired Usability published an article summarising the guidance in Med-Tech Innovation News. In the last 17 years there have been a number of different international standards and iterations of standards describing the application of human factors to medical device development. The most recent including, IEC 62366-1:2015 Medical Devices Part: Application of usability and the 2016 version of the FDA’s Guidance document “Applying Human Factors and Usability to Medical Devices”. The MHRA’s human factors guidance represents the first written human factors guidance from a European regulatory agency. Fortunately, the MHRA’s guidance draws heavily on the decades of medical device human factors guidance and international standards and even states at the start that its aim is to be consistent with these documents. What is in the MHRA’s Human Factors Guidance? The usability engineering process described in the guidance document is the same as the process described in IEC 62366-1:2015 and the FDA’s guidance. The guidance here clearly states that human factors is not a check-box activity. As with all human factors guidance the effort should be scaled according to complexity and risks associated with the device. The guidance states, “user testing and Failure Modes and Effect Analysis (FMEA) are normally considered the minimal requirements”. Assess the completion of tasks and gather subjective data on safety and ease of use. Finally, usability engineering should be incorporated into the post-market surveillance strategy for all medical devices.